celebrate community, culture, and tradition through the years. 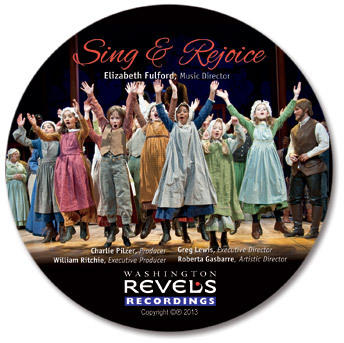 Sing & Rejoice presents a potpourri drawn from Christmas Revels productions, featuring previously unrecorded music: choral anthems, rousing rounds, audience favorites, and other songs, familiar and new, spanning eras from medieval Spain to 20th-century America and countries around the globe. It not only marks our 30th anniversary, but also celebrates the common threads―music, community, and tradition―that bind us through the ages as a human race. For that, we sing and rejoice! place. Revels celebrations include adults and children of all ages, professional and non-professional. and holiday parades. Five smaller ensembles perform over 40 times a year at different venues. leave Washington Revels events with smiles on their faces and joy in their hearts.